(Nanowerk News) Researchers at UC Santa Barbara have provided the first clear demonstration that the theory of quantum mechanics applies to the mechanical motion of an object large enough to be seen by the naked eye. Their work satisfies a longstanding goal among physicists. 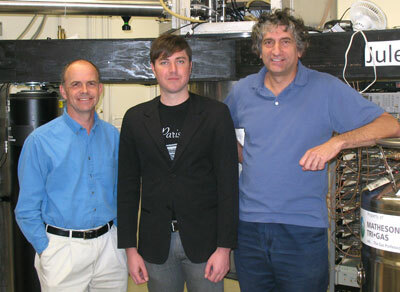 In a paper published in the March 17 issue of the advance online journal Nature, Aaron O'Connell, a doctoral student in physics, and John Martinis and Andrew Cleland, professors of physics, describe the first demonstration of a mechanical resonator that has been cooled to the quantum ground state, the lowest level of vibration allowed by quantum mechanics. With the mechanical resonator as close as possible to being perfectly still, they added a single quantum of energy to the resonator using a quantum bit (qubit) to produce the excitation. The resonator responded precisely as predicted by the theory of quantum mechanics. "This is an important validation of quantum theory, as well as a significant step forward for nanomechanics research," said Cleland. The researchers reached the ground state by designing and constructing a microwave-frequency mechanical resonator that operates similarly to –– but at a higher frequency than –– the mechanical resonators found in many cellular telephones. They wired the resonator to an electronic device developed for quantum computation, a superconducting qubit, and cooled the integrated device to temperatures near absolute zero. Using the qubit as a quantum thermometer, the researchers demonstrated that the mechanical resonator contained no extra vibrations. In other words, it had been cooled to its quantum ground state. The researchers demonstrated that, once cooled, the mechanical resonator followed the laws of quantum mechanics. They were able to create a single phonon, the quantum of mechanical vibration, which is the smallest unit of vibrational energy, and watch as this quantum of energy exchanged between the mechanical resonator and the qubit. While exchanging this energy, the qubit and resonator become "quantum entangled," such that measuring the qubit forces the mechanical resonator to "choose" the vibrational state in which it should remain. In a related experiment, they placed the mechanical resonator in a quantum superposition, a state in which it simultaneously had zero and one quantum of excitation. This is the energetic equivalent of an object being in two places at the same time. The researchers showed that the resonator again behaved as expected by quantum theory.